5.9% bigger, so yes but only just . I'm sure I read somewhere that a dealer in Australia is selling cars with them fitted and still warrantied. Replied by saxj on topic NEW Jimny TYRE choice discussion. Replied by muto on topic NEW Jimny TYRE choice discussion. I have some rubbing in my stock Jimny with 215/75R15 and Hankook RF10s. Luckily only when four persons in the car and driving to potholes. muto wrote: I have some rubbing in my stock Jimny with 215/75R15 and Hankook RF10s. Luckily only when four persons in the car and driving to potholes. Is that a Gen3 car though? Gen4s seem a bit roomier in the arches. Interesting. I assumed from the pictures that there is much more room in the arches than the Gen3 but it appears not! Yeah, it's 3gen. Forgot to mention that. Many say that this size is ok for 3gen, but seems that not exactly true if the tire is more aggresive. Replied by Matt on topic NEW Jimny TYRE choice discussion. So has anyone tried 235/75 tyres on a Gen 4 Jimny yet and can share their experience? I'm getting a new Jimny later this week and I'm planning to swap the tyres for KO2's but I'm still unsure about the size. 215/75 seems like the safe choice, but I read in a magazine here in OZ you can legally put 235/75 on the stock rims. What I'm trying to find out is whether they fit well without a lift. Yeah I took a demo for a spin with 235/75 RF10 AT-Ms. It took the fun out of the on-road performance - noticeably slower to accelerate, and quicker to slow down that the originals, but I didn't check the tyre pressures. BFGoodrich say you legally need minimum of 6" rims for 235/75 (I asked them) but it might vary by state. imo 235 are total overkill for the mass of the vehicle, and look a bit ridiculous when you realise it has solid axles and a retro look. I would look at 215/75 and 215/80 - on original rims and no lift required. The dealer's not going to give you anything for the original tyres so you might as well start with them and get a feel for them as your baseline (while you're running it in) before you upgrade and start hammering the engine and drivetrain. Matt wrote: So has anyone tried 235/75 tyres on a Gen 4 Jimny yet and can share their experience? I'm getting a new Jimny later this week and I'm planning to swap the tyres for KO2's but I'm still unsure about the size. 215/75 seems like the safe choice, but I read in a magazine here in OZ you can legally put 235/75 on the stock rims. What I'm trying to find out is whether they fit well without a lift. Hi Matt, congrats on the new Jimy! Remember the 5% rule regarding warranty too. I'm going to go with 215/75/15. What colour you chosen then? Is the 5% rule in the small print in the warranty (in the service booklet)? Replied by Generation4 on topic NEW Jimny TYRE choice discussion. Looking to buy a Jimny 4th gen this year. Been informing myself on various topics. 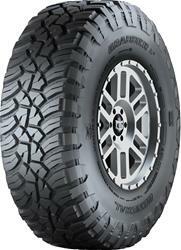 Apparently, this new General Grabber X3 outperforms even the BFG MT KO2, and it's available in 215/75R15. Last edit: 13 Feb 2019 10:29 by Generation4. Reason: Imagelink didn't show picture, so added it in attachement directly from dir. Replied by G-imny on topic NEW Jimny TYRE choice discussion. Thanks for the article, interesting read and result. Just to clarify, it’s the BFG MT KM2 not KO2. I think the KO2 is the all terrain tyre?